Few plants can equal the beauty and command of a Japanese Maple in the autumn landscape. As a solitary specimen it is breathtaking, its fall foliage remaining for weeks, then falling into a brilliant pool of crimson, orange, or gold on the garden floor. As an accent in the border, it draws the eye to its blazing canopy of color, enlivening an area that might otherwise be dull in autumn. And in a large planting along a walk, driveway, or slope, it creates a ribbon of color brighter and more attractive than the most beautiful lights. Many varieties of Japanese Maple are dwarf enough to be grown in containers and even as bonsai. These offer a moveable display of color on a miniature scale, their exquisitely divided foliage available for close inspection. Inherently an elegant tree, in the modern garden Japanese Maple may find themselves among shade-loving perennials or even cheery annuals — and why not? They are superb season-extenders for all summer-interest plantings, and offer much-needed dappled shade to understory plantings three seasons of the year. Below is a brief overview of the ideal conditions for growing Japanese Maple, followed by some detailed recommendations. If after a year or two your Japanese Maple does not seem to ideally situated in your garden, don't be afraid to dig up it up and move it. Location is one of the most important factors in growing this tree successfully, so a bit of trial-and-error may be in order. The best time to move the tree is in late summer or early fall, at least a month before the ground freezes. Your Japanese Maple will be very forgiving -- but cut a very wide and deep hole around it and leave as much soil clinging to its roots as you can when you dig it up! Protection from Strong Wind - The foliage of Japanese Maples is quite fragile, drying out quickly in high winds. Of course, this doesn't mean you have to grow the tree in totally enclosed or protected areas. Just make sure it isn't being whipped around by wind on a regular basis, and it will be fine. Well-drained, Consistently Moist Soil - Japanese Maple flourish in any well-drained soil except highly alkaline soil. Many gardeners grow them in acidic conditions, where they pair beautifully with Rhododendrons, Camellias, and Kalmias. But they are also perfectly content in neutral and even mildly alkaline pH. The only other soil concern is salt. Japanese Maple tolerate heavy clays, loose sands, and everything in between, but they do not like salt soils. (Salt spray is another matter; they have quite a good tolerance for that!) If your soil is high in salt, consider growing your Maple in a container. Japanese Maple are greedy feeders, especially when young. Before planting, work as much compost as you like into the soil around the tree, and keep adding it during spring and early summer. Composted matter not only adds valuable nutrients to the soil, it tends to retain moisture, which Japanese Maple love. These trees are quite drought-tolerant when mature, but like most young trees, they need regular deep waterings during the first few years. Plan to water heavily twice a week during normal weather and three or even four times weekly in periods of drought. Whether your tree is young or mature, it will grow best in soil kept consistently moist by regular watering and mulching. A 3-inch layer of shredded bark around the entire root zone of the tree (but not touching the trunk) works well in all seasons. To encourage the most spectacular color show in fall, reduce the amount of water you give your Maple in late summer and early autumn. Of course, do not let it dry out completely, but cut back so that it stops producing more green leaves and begins its fabulous color changes. You will be amazed at the difference this makes! Protection from Late Spring Frosts - Spring is the season when your Japanese Maple is most prone to damage. It leafs out early — the first hint of warm weather will cause it to break dormancy. In many climates, there are several frosts in store after that initial warm period, and these can be dangerous, especially to young trees. Keep the tree covered when the forecast calls for frost. 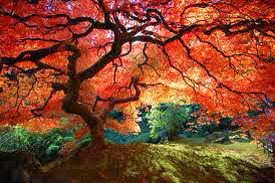 Autumn is the best time to plant a Japanese Maple. Ideally, you should plant at least a month before the ground freezes, so it has time for some root growth before winter. But if you find yourself planting late, don't worry. Your tree will wait patiently until spring to begin settling into its new home! After planting, lay down 3 inches of mulch around the tree and keep it well watered until winter. Unfortunately, late summer and early autumn is the best time to prune your Japanese Maple. It seems unfair to cut it back just as it's coming into its season of glory, but this is really the best time of year to prune. And as you might expect from its widespread use in bonsai, this tree responds very well to pruning, though it certainly doesn't need an annual trim. We recommend that you inspect the tree annually and remove any dead or crossed branches, lopsided growth, and other unattractive features. If your Japanese Maple is quite dense, you might want to open it up a bit from the center to let more light and air in. And if you like, it can easily be shaped into just about any form that suits your garden. Many gardeners prune Japanese Maple quite heavily when young, to remove multiple stems and create a single-trunk tree. Unless your weather turns exceptionally dry, reduce the amount of water you give the tree in autumn. This will stimulate better color changes. And as autumn comes to a close, be sure your Japanese Maple has a nice thick layer of mulch, and pluck off any dead leaves still clinging to its branches. Winter is a carefree season for Japanese Maple grown within their hardiness range and mulched in late fall. The only concern is heavy snow loads, which might cause some branches to snap. After a particularly heavy snowfall, brush away any large accumulation of snow, being careful not to treat the branches too roughly. Ice, on the other hand, should be left in place. It freezes onto the branches and is best left alone. Spring is the most vulnerable time for your Japanese Maple. As discussed above, the tree will leaf out early — often spectacularly! — and then suffer in late frosts. Keep it covered whenever frost threatens. As soon as the weather settles down, begin a regular watering and feeding schedule. Summer is the only time you may ever notice pests on your tree, and most of them are completely harmless. If aphids become a problem, treat them with the same pesticide used for Roses, and they will vanish. During very hot weather you may notice the ends of the leaves drying out and curling. This is unsightly and may indicate that your tree needs more shade, but unless it occurs over a long period every year, it won't be fatal. Stressed-out Japanese Maple have been known to drop every leaf from their branches and still recover beautifully — usually re-leafing during the same season! As summer draws to a close, reduce the amount of water you give your Japanese Maple. This will stimulate those magnificent color changes more quickly and intensely.